I'm an underwater cameraman with a post-grad background in marine biology. 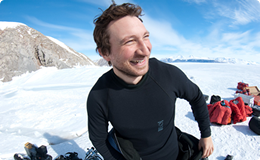 I worked as a camera assistant for several years on productions such as Planet Earth, Oceans and Life before then shooting sequences for Life, and subsequently Frozen Planet, Desert Seas (Nat Geo), Africa and Wild Arabia. I have pretty extensive diving experience, with several hundred dives under ice, and hundreds of hours on various types of rebreathers. I've shot 3D underwater with housed mirror rigs (for The Bachelor King - Sky3D), underwater super high speed on sailfish and great whites. I've also built under ice sets for tank based macro work. I have also spent way too much time developing long exposure, synched light source, multi-camera underwater timelapse rigs. Still working on an acronym for that. Red Epic-M with PL and Optitek F-Mount, Gates Deep-Epic Underwater Housing, 200w LED Underwater lights, 2 x D200 Aquatica housings, F-Mount lenses, primes, macro, wide and fisheye, PL-mount 11-16mm Duclos, Sentinel Rebreather, Biomarine Mk15.5 Rebreather, Full face mask and UW comms, extensive scuba equipment for any water temperature and scenario, time-lapse kit , underwater studio-like timelapse kit, motion control kit (pan tilt and track) for realtime (ie Epic), lapsed time and time-lapse work, diver back mounted propulsion device, emergency diver radio and GPS units, theraputic emergancy oxygen rebreather unit.